The topic of GMOs is a complex one. Many of the sites listed on the first 10+ pages of a simple Google search will point to statements like “GMOs have not been proven safe” or “they have not been tested safe for consumption.” GMOs are often referred to as dangerous, toxic or even as time bombs. Many state that GMOs must be “immediately outlawed or banned.” All this serves to do is to create unnecessary fear in the minds of the consumer. And it most certainly is not a true representation of the science and how genetic engineering and genetically engineered crops have and can benefit farmers and consumers – and society more broadly. “Every major international science body in the world has reviewed multiple independent studies—in some cases numbering in the hundreds—in coming to the consensus conclusion that GMO crops are as safe or safer than conventional or organic foods.” – Jon Entine, Forbes. B.J. 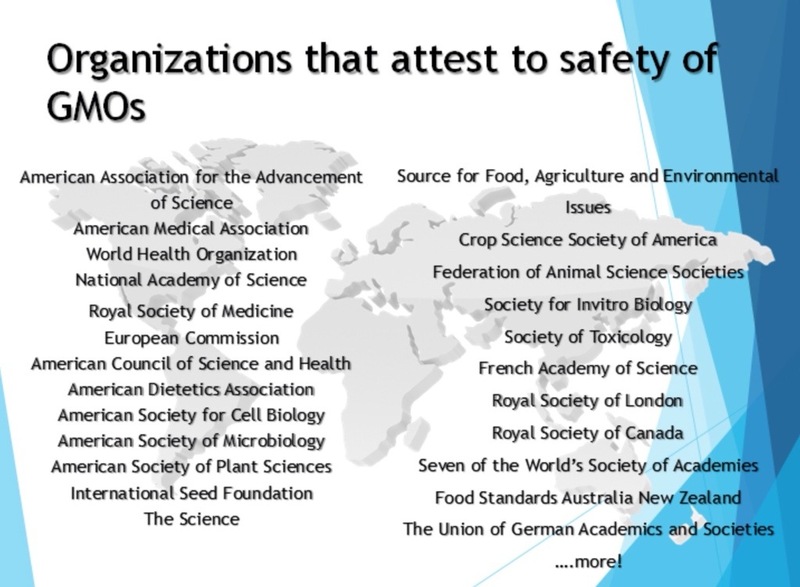 Murphy (@SciTechJunkie) lists some of the statements that those organizations make in support of GMOs here. Yes. And we have never lived in a time when we are in a position to so readily deploy science in such meaningful ways. Yet, we are often blocked by a loud but vocal minority of individuals and organizations that have the capacity to influence the public’s opinion on such things. “…no single agricultural technology or farming practice will provide sufficient food for 2050…instead we must advocate for and utilize a range of these technologies in order to maximize yields.” Mark Rosegrant, Director, International Food Policy Research Institute (2014). Everyone wants a safe and healthy food supply. 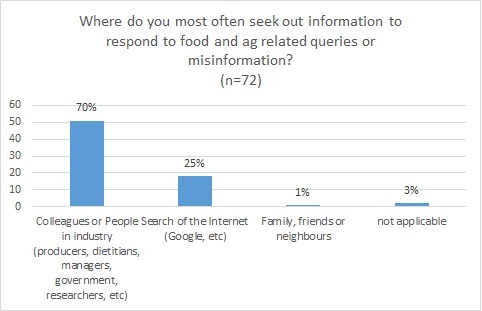 But people also need to have access to accurate information in order to make informed choices about their food. Want to know more (facts) about genetic engineering, GMOs, regulatory bits and bites and other related stuff? 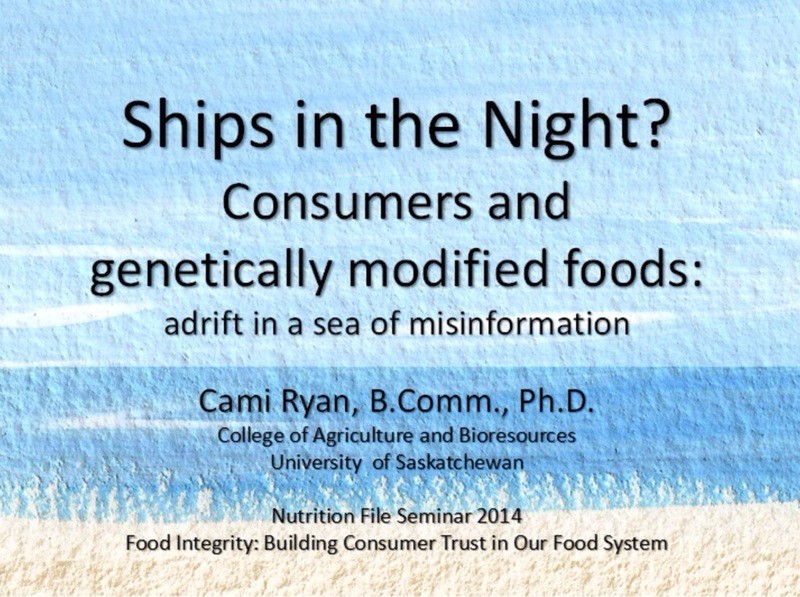 Check out my five part series on GMOs and public perceptions: Part 1, Part 2, Part 3, Part 4, Part 5. I had the opportunity to speak to a large and engaging group of farmers and industry people at this year’s FarmTech in Edmonton. It was my first FarmTech and it was a great experience! 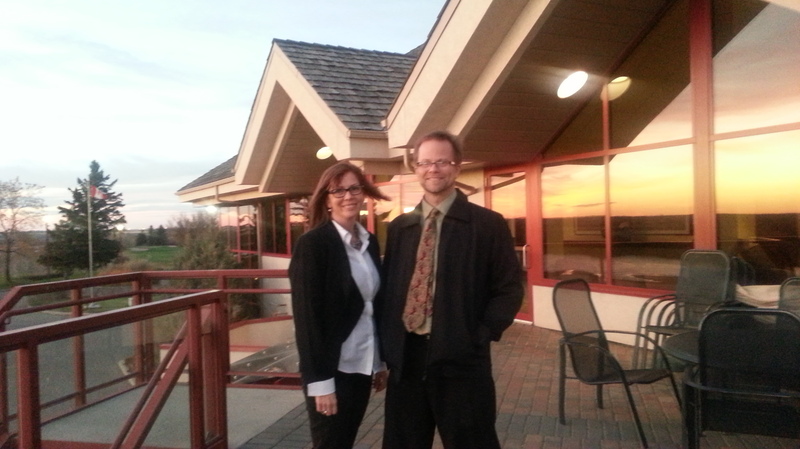 The title of the presentation was The Art and Science of the Ag and Food Conversation. It combined some mythbusting with a bit of ‘landscape analysis’ of our often convoluted conversational spaces around ag and food. Human cognitive habits figured in there heavily (see my blog post on this). I conducted a live poll (via Poll Everywhere) during both sessions and folks were kind enough to participate. Here is a summary of the combined results from both sessions. 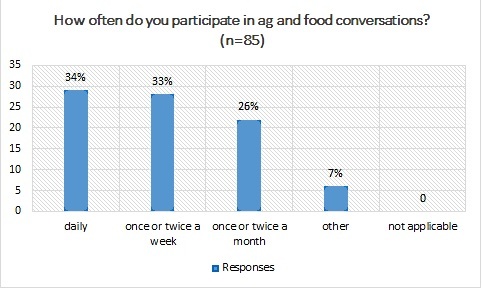 Almost everyone (95%+) in the audience(s) participates in ag and food conversations and quite often (not surprising, given the audience). 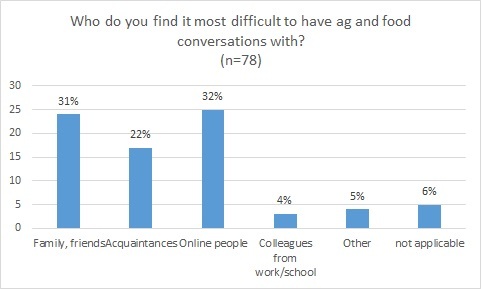 Eighty-five percent (85%) of voters said that they have had an experience where things got “ugly” in an ag and food conversation. This speaks to the ‘complex conversational terrain’ (as I refer to it) that agvocates have to deal with and, of course, to the growing ag industry image problem. 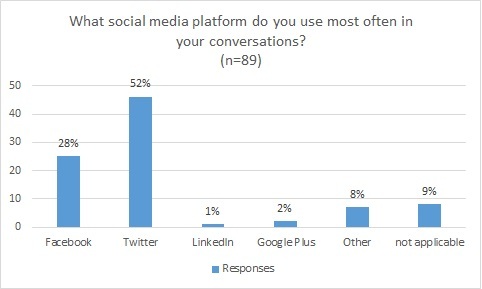 And… it turns out that Twitter is KING (according to @MichealWipf) in terms of preferred social media platforms (see graph below). Tweet on!!! 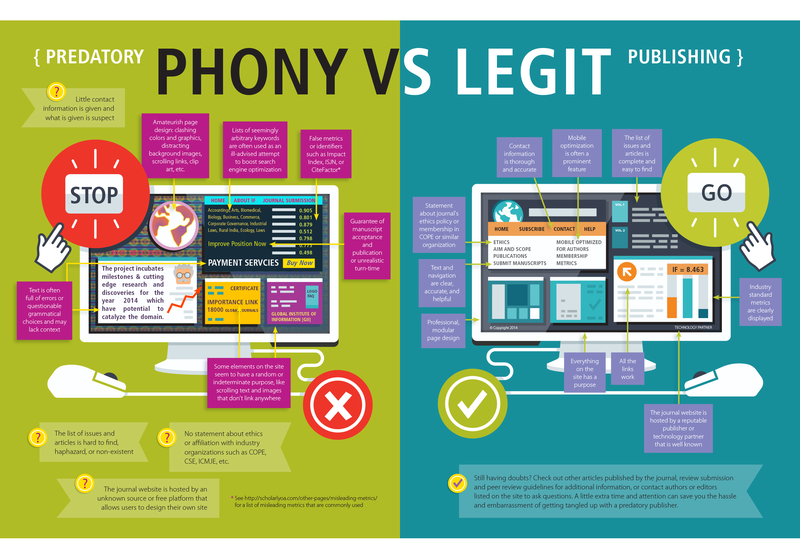 I often bring up another related issue: common misconceptions about who the experts really are out there. 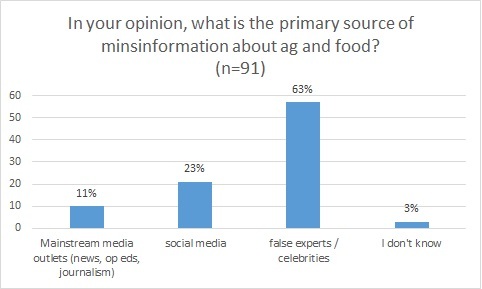 In the polling results, ‘false experts / celebrities’ came out as #1 with 63% of the votes as primary sources of misinformation. There are many examples of psuedo-experts out there: Dr. Oz, Joseph Mercola, Pam Anderson (the “large animal expert”). For the record, quite a few people commented that an “all of the above” option on the poll would have been useful. My bad. That’s the hazards of developing surveys ‘on the fly’ sans peer review. Anyway, had I included it I suspect that most, if not all, responses would have wound up in that category. When I am stuck and not sure where to find information from good sources, I turn to my colleagues in agriculture and/or science. 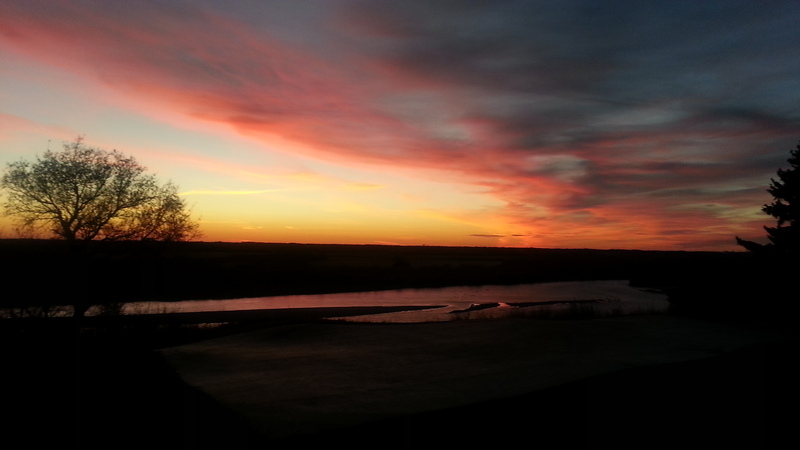 And it appears that many of the folks at FarmTech do too. Will agriculture be allowed to feed 9 billion? : Rob Saik, CEO of The Agri-Trend Group of Companies is a Professional Agrologist and a Certified Agricultural Consultant. Rob is also the producer of the forthcoming documentary Know GMO: an uplifting discussion about food. Marco and Justin have complied a list of video resources here on Facebook. There is a five part series on GMOs on Best Food Facts’ YouTube channel (scroll down, but there’s other great stuff in there as well). Jimmy’s Food Fight: Jimmy Doherty, pig farmer, is one-time scientist and poster-boy for sustainable food production is on a mission to find out if GM crops really can feed the world. Steve Novella on “The Google University Effect” on NeuroLogica Blog is fantastic! Additionally, GMO Skepti-Forum has an amazing list of resources outlined including some great narratives… check out 500 words! Nodes of Science has what I refer to as “A Guide for Intellectual Honesty”… how to identify B.S., how to assess the credibility of authors and articles, how to access good research, and how to ask for help.